This page is for the original release. For the Unrated version, see Agony Unrated. 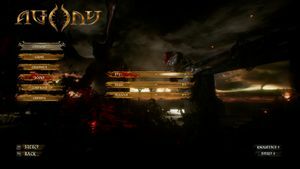 Loading screen is stretched across monitors; Cutscenes work fine on the center monitor; HUD is spanned across all monitors; FOV is stretched. In-game FOV slider from 40 to 120. Main menu is capped at 30 FPS. 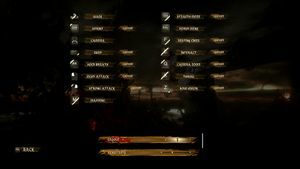 This game takes advantage of Tobii Eye Tracking. 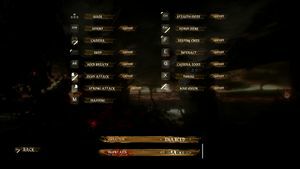 SFX, Music and Dialogs volume sliders. 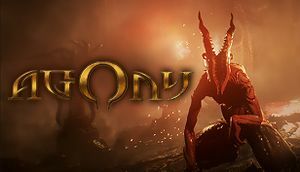 See Helix Mod: Agony (DX11). ↑ 1.0 1.1 File/folder structure within this directory reflects the path(s) listed for Windows and/or Steam game data (use Wine regedit to access Windows registry paths). Games with Steam Cloud support may store data in ~/.steam/steam/userdata/<user-id>/487720/ in addition to or instead of this directory. The app ID (487720) may differ in some cases. Treat backslashes as forward slashes. See the glossary page for details. This page was last edited on 29 March 2019, at 02:50.